Current General Coordinator and Advance CSU candidate Omar Riaz and student life coordinator candidate for the ACT slate Daniel Jolicoeur have both come under fire for perceived conflicts of interest with the CSU’s current health and dental insurance provider, the Alliance pour la santé étudiante au Québec. 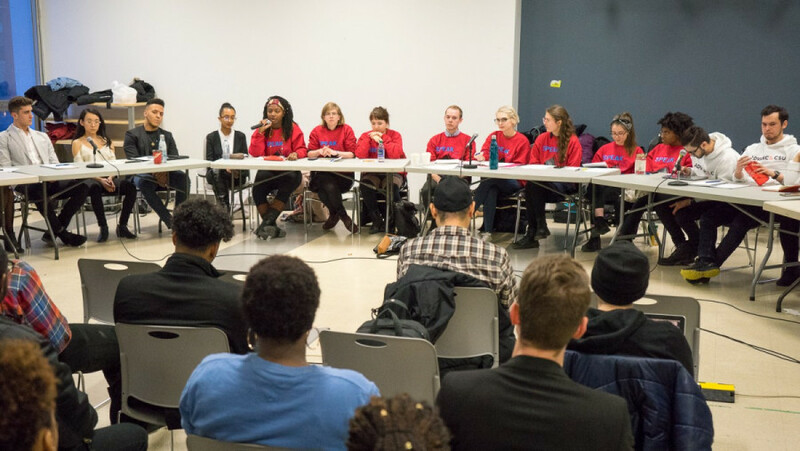 “It’s important that when we’re going into negotiations with these companies that we are working in students interests exclusively,” said John Hutton, who running for finance coordinator with the Speak Up slate. Nicholas Roberts, the elections officer for the election, told The Link he’s begun an investigation into Jolicoeur, but said he couldn’t give any more details before press time. Jolicoeur has been working for ASEQ for about two years, and is currently a senior agent for the company. He said that he only works with insurance claims and answers questions students have about the insurance plan. ASEQ provides insurance to multiple student unions across Canada, and has been working with the CSU since 1996. The CSU does not have a conflict of interest policy, therefore there aren’t by-laws or standing regulations that prohibit Jolicoeur from running in the election despite his perceived conflict of interest. Jolicoeur later said that if he was elected to the CSU, he would quit his job at ASEQ. Despite the fact that the CEO let Jolicoeur run, Riaz said that he’s uncomfortable with him running as current employee of ASEQ. Jolicoeur also said that if elected he would like to work on the health and dental committee, and bring wants students to better understand what their coverage, and how to take advantage of the insurance plan. Early in the school year, Riaz and former CSU Finance Coordinator Soulaymane El Alaoui took a trip paid by ASEQ CEO Lev Bukhman to a student union conference in British Columbia. The two were issued formal warnings from council and mandated by them to write an apology letter for engaging in a perceived conflict of interest. The CSU later started a health and dental plan committee to look at the possibility to getting services provided by ASEQ on campus. Some of the services included having ASEQ personnel within the school to help students make health and dental claims. Due to the perception of conflict of interest, Riaz and El Alaoui were barred from directly negotiating with ASEQ regarding those plans. That agreement doesn’t expire at the end of the year. If re-elected Riaz couldn’t represent the students in the negotiations, unless it’s allowed by the next council. When asked about potential changes to the health and dental plan at the CSU debate on last Thursday, Riaz responded and said that he wanted to have ASEQ employees on campus to help students, and to make sure international students have access to health plan as they pay a lot more for insurance than Canadian students. Hutton added that his slate has emailed a complaint to the CEO to let him know Riaz has included health and dental plans in his campaign plans despite council having barred him from representing students in negotiations health and dental in September. Hutton said he’s yet to hear anything back. Riaz said that despite the motion barring him from working directly with ASEQ, he can still have a vision on the health and dental plan. In February 2017, the CSU began a request for proposals to review their policy with ASEQ, and look at other insurance plans for undergraduates. When the process finished the CSU entered a new three year contract with two possible one year extensions with ASEQ. Right after the process began, ASEQ had sent the executive team ASEQ branded water bottles. In the interest of transparency, the executive disclosed the gifts to council during a meeting on Feb. 2, 2017. After the gifts were disclosed, the executive was mandated to disclose any gifts that were received in their monthly reports, and the CSU’s policy committee was then mandated to draft a gifts policy—work that has just begun a year later. Riaz said that he wrote a draft policy and submitted it to the policy committee to reviewed. It also says that if an elected representative does receive a gift, return it if it’s possible or raffle it to students. They must also inform council of the gift, and describe how it was disposed of. Because the policy must still be reviewed, this policy draft is subject to change.